1xRun: Tell us a little bit about this piece, when was it created and with what materials? Is it still for sale? How long would you say it took from start to finish? Mia Araujo: This painting was accepted into and will be published in Spectrum 20, the science fiction/fantasy art annual! I am very excited about that. I finished painting it in April 2012, for my solo show that May. It was created with acrylic on wood. 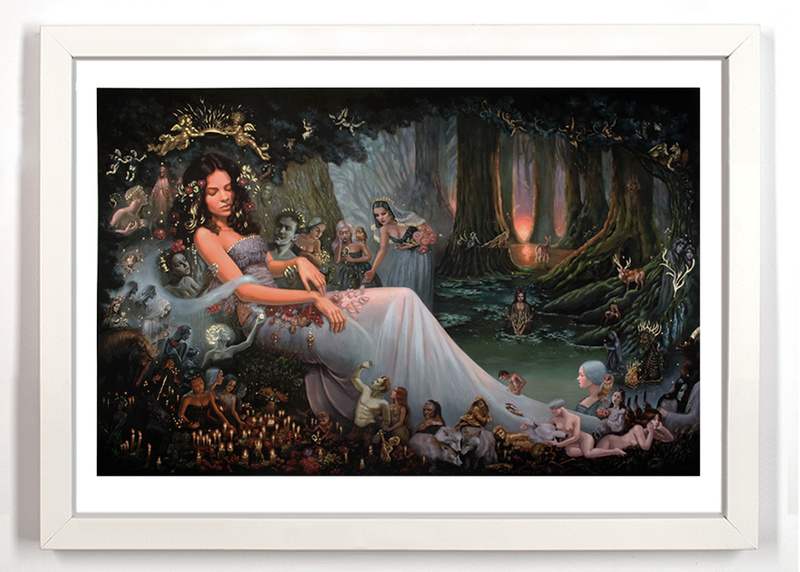 The prints are giclee on paper and hand-embellished with iridescent gold acrylic paint. Yes, the original is available- for collectors who would like to add a massive piece to their collection, please contact Corey Helford Gallery. It must be seen in person for full impact! From start to finish I would say it took about 4-6 weeks. It was very quick for how long my pieces usually take. 1xRun: Tell us how the idea and execution came about? Mia Araujo: My solo show ‘Into the Woods’ was inspired by Hayao Miyazaki’s “Princess Mononoke” and John Muir’s writings, and depicted different aspects of the forest, as a landscape. I wanted the centerpiece to show the fragility and beauty of forests, to inspire a love and desire to protect them. Instead of painting a cataclysmic forest fire scene, I chose to capture the beauty of a dying forest in its last moments of splendor- like a memory one wishes to preserve and hold onto forever, and as a reminder of the great things that are often lost. With a fire just appearing on the horizon, tiny timbermen gut an ancient forest by cutting the center-most tree out of the picture. 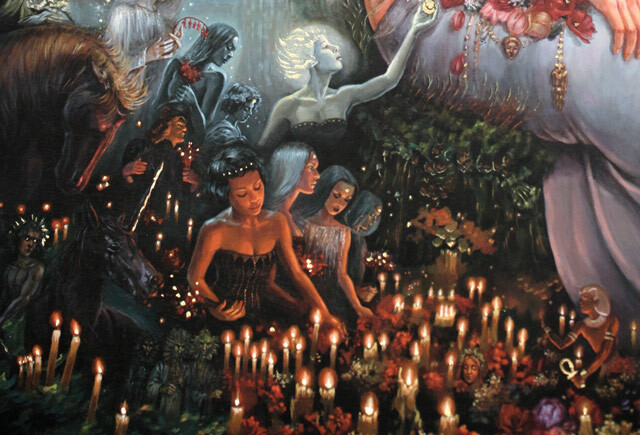 The larger-than-life forest goddess dies with her forest, and all of the denizens and tree spirits, ghosts, and animals who once lived there congregate to attend her funeral. Like all of my paintings, this one was very spontaneous after the final drawing was finished. I transferred it on the panel, and then figured out the color palette as I went, starting with the areas I felt most certain about. I still can’t believe I was able to finish such a monumental piece in the amount of time that I did. There are more than 100 characters, animals, and objects in it, and each one had to be rendered…pretty insane, I know! 1xRun: What is unique about this piece? 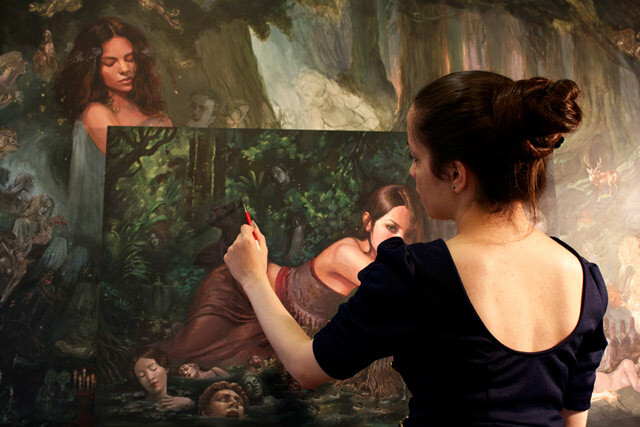 Mia Araujo: It is the largest painting I have ever created, at 60” x 40”, with the most figures, animals and details that I’ve ever put into one piece. 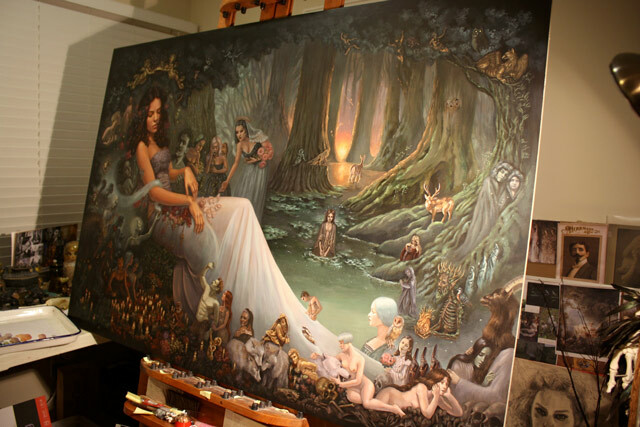 It was the centerpiece for my solo show at Corey Helford, and was accepted into the Spectrum 20 annual. 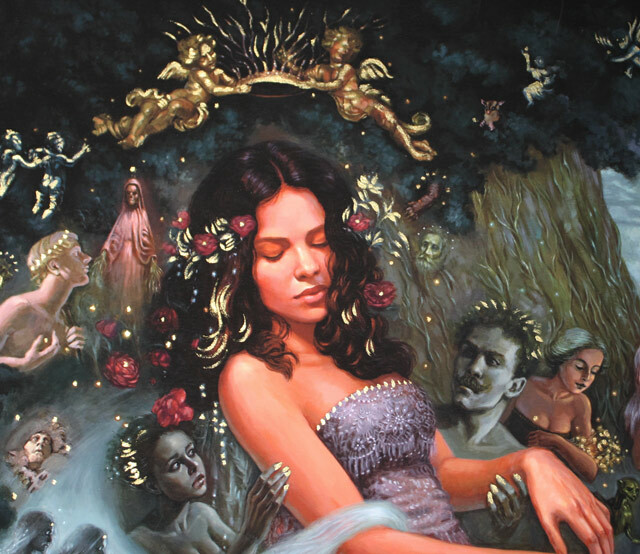 Mia Araujo: It’s the most complex scene I’ve ever painted, and looks fantastic at this size- it won’t take too much room on a wall, but is large enough to appreciate all the details. 1xRun: Describe the piece in one gut reaction word. Mia Araujo: Epic. 1xRun: It has been a little bit since your last release with us, what have you been up to? 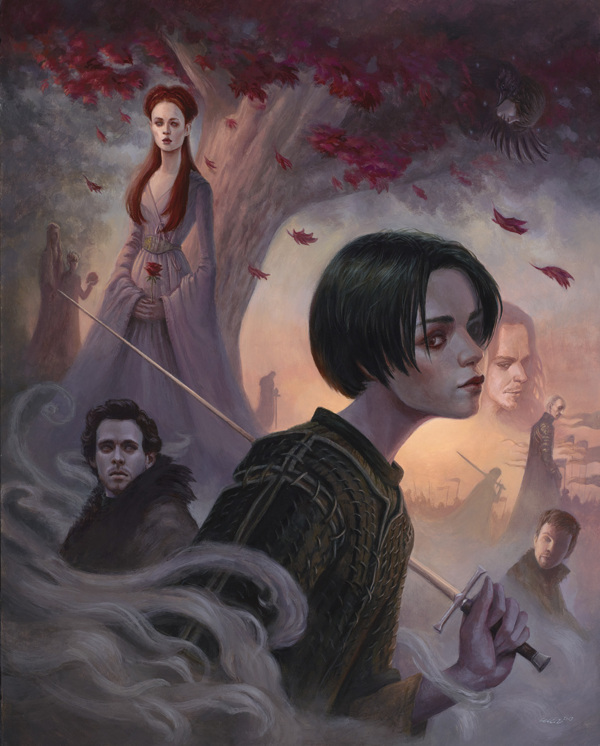 Mia Araujo: Since my last run, I’ve been working on some group show pieces, including one for Mondo and HBO’s ‘Game of Thrones’ show in Austin, TX. It was a dream come true to be a part of that, and to paint some of my favorite characters. 1xRun: How has 2013 been shaking out so far for you? Mia Araujo: Great! I have a new life that I’m happy with and proud of, and have been working on several projects and paintings at once. 1xRun: Any big plans for the rest of the year? Mia Araujo: More small originals will be available through my online store (so check back often! ), and I will be working on a secret project that I’m super excited about.